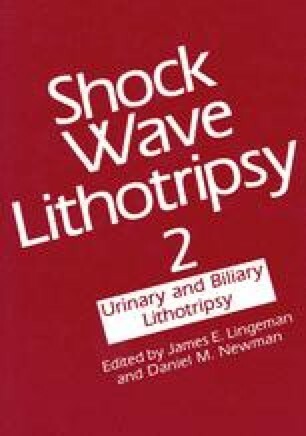 The stone-free rate after extracorporeal shock wave lithotripsy (ESWL†) is primarily determined by a plain abdominal radiograph (KUB) alone. However, the accuracy of that assessment can be challenged by renal tomography and flexible nephroscopy. Herein is a report on 29 patients with large renal calculi treated with a combination of percutaneous nephrostolithotomy (PCNL) and ESWL. Stone-free rates were determined by KUB, renal tomography, and flexible nephroscopy. The KUB and renal tomography overestimated stone-free rates by 35% and 17% respectively, compared to flexible nephroscopy. For determining stone-free rates after ESWL, renal tomography is superior to KUB alone. Also, among patients with large renal calculi, the use of the flexible nephroscope markedly improves the stone-free rate.